It's hard to know what to do when a bully is making your life miserable. 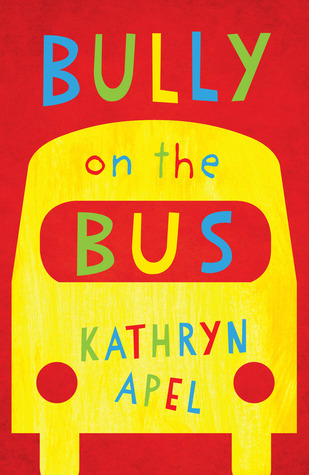 Katheryn Apel captures the emotional upheaval and the unwillingness to tell trusted adults perfectly in her verse novel for younger readers. An older girl is bullying Leroy every day on the bus and he feels wretched. His big sister Ruby tries to help, but ultimately, Leroy is the one who must reach out for help. This is a book that might help a child who is being bullied have the courage to tell a trusted adult or stand up to a bully. 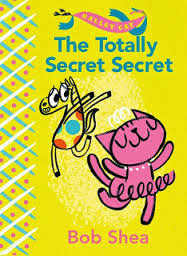 In an interesting parallel, Leroy's teacher gives him a book that contains HIS secret weapon against the bully! There are just a few Aussie words that might be unknown to a US reader, but nothing that can't be understood with just a bit of inference. 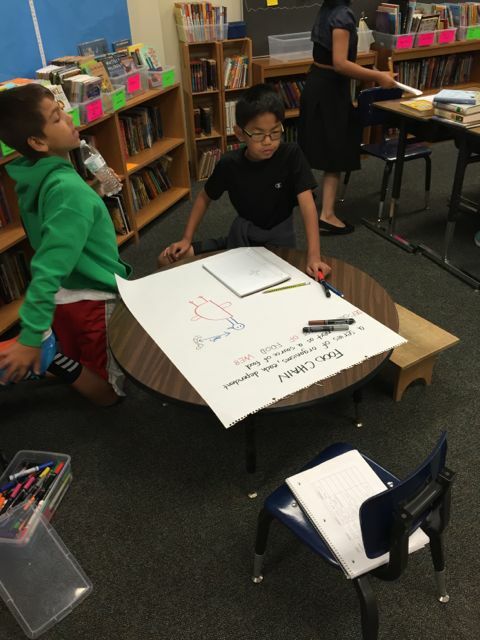 Just about a month ago, I was setting up my classroom and imagining how all of the spaces I'd designed would be used once the students came. 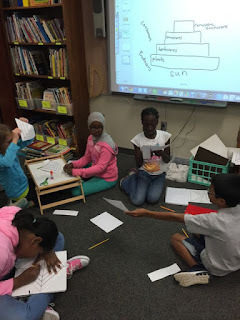 Last week, during independent work time in science, when students had the choice to work on some anchor charts for the classroom, or on a 3-D energy pyramid, I looked around the room and was thrilled to see that every single space I had imagined was being used! YAY! 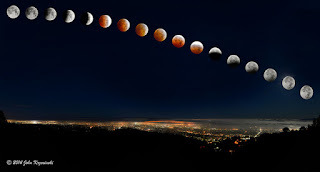 Mark your calendar and set your alarm -- there's going to be a total lunar eclipse this Sunday night peaking about 10:00 PM. It's an eclipse of a Supermoon! Way cool. The eastern half of North America will be able to see the entire eclipse. Read more about it here and here. 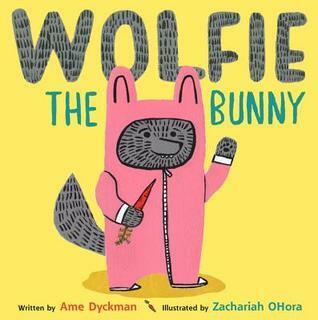 This week, Janet Wong is hosting the Poetry Friday roundup at Sylvia's blog Poetry For Children. 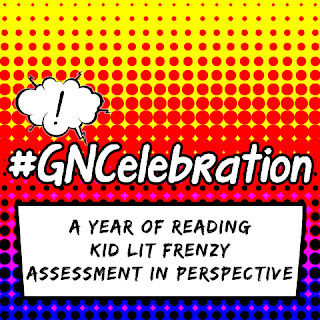 We'll be celebrating graphic novels every Thursday in October! Head over to The Nerdy Book Club for 10 Reasons to Join Us in Our October Graphic Novel Celebration! 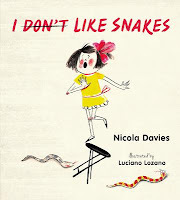 I don't remember where I heard about the book I Don't Like Snakes but I am always looking for good nonfiction and I pretty much buy anything and everything written by Nicola Davies. Thank you to whoever it was that posted about this book because I am so happy I discovered it! A little girl is part of a family who has snakes. Everyone in her family LOVES snakes but she does not like them. At all. She has lots of reasons for not liking snakes--they slither, their skin is slimy and scaly, they have flicky tongue, and more. There are so many reasons not to like snakes! But on each 2 page spread, the little girl is spending time with her family, letting them know why she doesn't like snakes. They start to explain to her why the things she doesn't like, are actually pretty cool things. The right side of each spread is more informational and takes the reader outside of the story to learn more about the characteristic that the family is explaining. Predictably, the little girl decides that she "really, really, reeeeealllly" likes snakes by the end of the book and readers may do the same. I love the way this is written and the way that the information is embedded in a story. 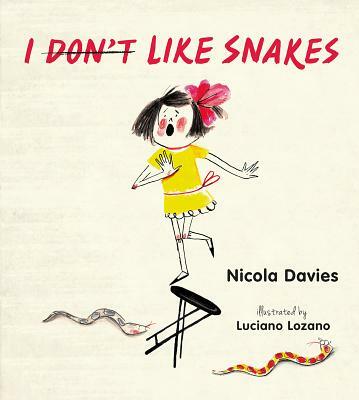 It is a book that will answer lots of kids' wonders about snakes. The illustrations by Luciano Lozano are quite fun and will draw readers in who may not typically read books about snakes. 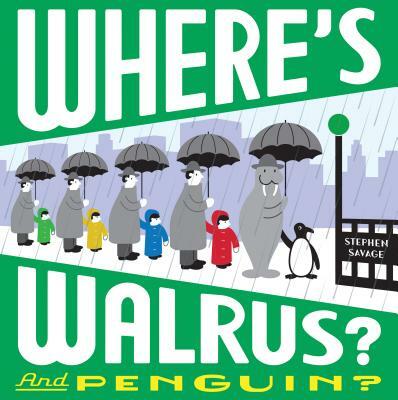 A great combination of story, information, and art. 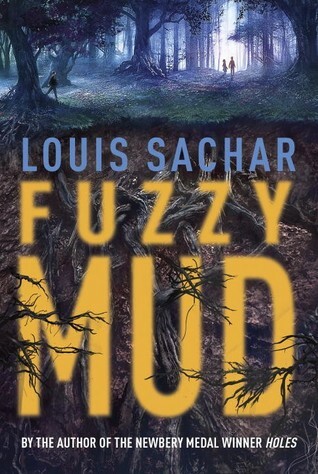 Fuzzy Mud by Louis Sachar is not the kind of book I would typically pick up. It looked like more of an adventure than anything else to me and I read more for character than plot. But this book is getting a ton of buzz and I LOVED Holes and Sachar's other books so I picked it up. Well, I was hooked on page 2 and am so glad I read it! What a great read! 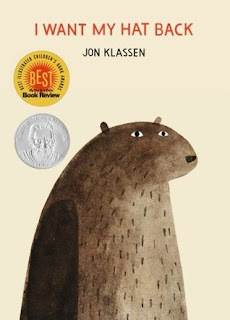 The book is about Tamaya, a 5th grader. Her friend, Marshall walks home with her each day but one day, (due to a bullying-type incident), Marshall decides that they need to take a shortcut through the forbidden woods. Needless to say, it doesn't go well and Tamaya discovers something in the woods that will change their city. The writing is fascinating as Sachar moves between Tamaya's story and excerpts from secret Senate Hearings. Sachar weaves this story together in a way that builds suspense and gets you to care about the characters. I don't want to give lots away as I loved reading this story and seeing how it unfolded without knowing too much about it. 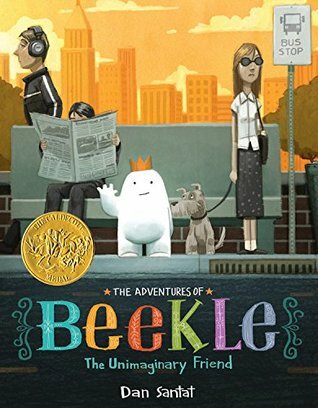 My thinking is that this would be a fabulous read aloud for 5thish grade. So much to talk about in terms of choices, consequences, how we treat others, etc. 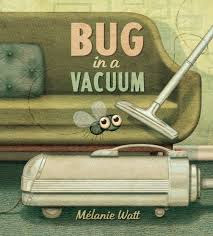 I also think this is the perfect book to hand to kids who love adventures, fantasy, science fiction, etc. I know that much of what I read is a more realistic, quiet, sad,hopeful type of reading and I love finding more books for readers who want more adventure. 5th grade seems to be a great age to introduce kids to science fiction/dystopia and this seems to be a good transition to that genre. Really, one of my favorite reads of the year! You be the pilot; I'll let you steer. You be applause; I'll be a shout. I'll be the banks; you be the stream. I'll be the fence; you be the vine. 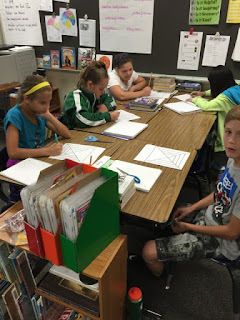 I've had fun with this form, introduced to us by Tabatha a couple of weeks ago. 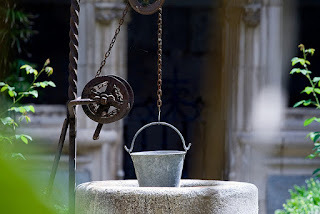 This week, Michelle has the Poetry Friday roundup at Today's Little Ditty, and next week, Janet Wong will be the guest hostess at Sylvia Vardell's blog, Poetry For Children. I had so much fun with Monday's "Pair Share" post, that I thought I'd highlight another new pair I just put in the tub! Austin is a pet store dog who wants a real home, so he sets off to check out every state to see if that's where he is meant to be. Readers get an interesting fact or two about each of the 50 states. With a name like Austin, you can imagine in which state he winds up, but I won't spoil the entire surprise ending. 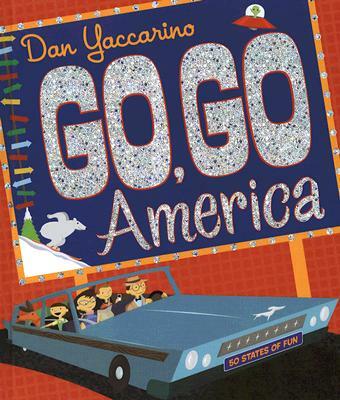 This book has one of the most fun table of contents ever -- it is a map of the U.S. with the path the Farley family takes from state to state drawn with a dotted white line and the page number for each state written in a road sign shape! The Farleys drive from Maine to Hawaii and there is a page or a double page spread filled with factoids about each state, its notable inventions and famous people, and its wacky laws. 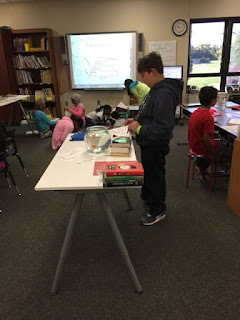 I started building the "Pair Share" tub one year when I had a group of students who were crazy about partner reading. I wanted to give this social approach to reading a little more depth, a little more meat. 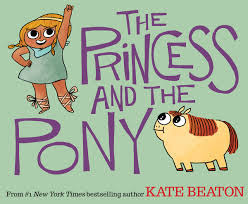 Rather than letting pairs always read one book together, I found pairs of books that went together in obvious or subtle ways. 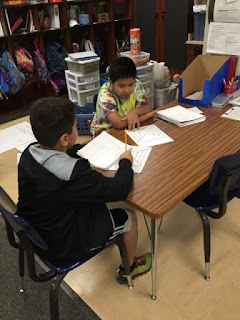 Then, when students wanted to partner read, they also had books that were partners! They could read each of the two books together and talk about them as they went, or they could sit side by side, each reading a different book, and compare their thinking after reading. They could also create an (optional) small project to share their reading and thinking with the class. 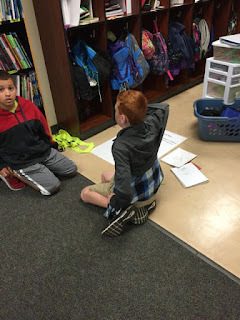 Because the "Pair Share" books are picture books, this partner reading is a short term break from a reader's typical 5th grade reading goals, but also serves to honor a Wide Reading goal in a fun way. When I received a review copy of Fab Four Friends, I knew I had the perfect book to pair it with for the "Pair Share" tub! Starting with John Lennon, Susanna Reich gives the reader a glimpse into each of the Beatles' (amazingly similar) Liverpool, England childhoods, right up to the point when they create or join the band. The book ends in 1963, with the "Fab Four" close friends on a still rising path to stardom. Today's youngsters (and anyone of an age and geographic background to have grown up on Johnny Cash and John Denver instead of John Lennon *points finger at self*) might have the impression that the Beatles' success happened suddenly, even magically. This book clearly shows that the Beatles' success was actually a lucky convergence of the the childhood dreams and hard work of four working-class city kids from not-so-ideal home lives. The book includes a helpful glossary (I didn't know what Scousers were, nor what a skiffle band was), and sources for the direct quotations in the book. (Yay! A children's biography without fake dialogue!) There are also book and web sources for further exploration. 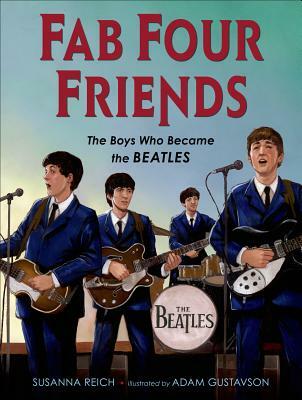 And if you want a more thorough, Fab Four Fan review of the book plus author interview, click over to Jama's Alphabet Soup. I'll pair Fab Four Friends with John's Secret Dreams. 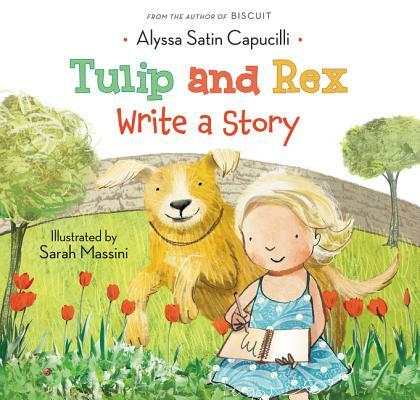 This book takes a totally different approach, both in the writing and the illustrations. 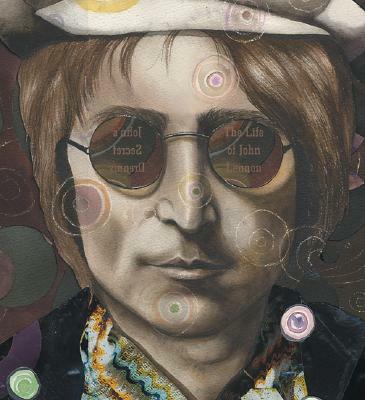 The focus is entirely on John Lennon, so the reader gets to see both his and the Beatles' entire lifespans. 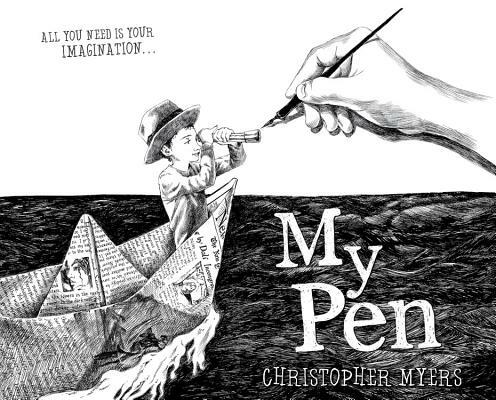 The illustrations are dreamy, impressionistic, and accompanied by snippets of song lyrics -- a definite change of style for Bryan Collier, but perfect for the topic. 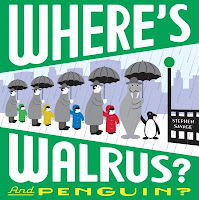 I was worried that today's students wouldn't have enough background knowledge of the Beatles or their music to understand how the lyrics work with the text and the illustration, but I should never second guess -- the details in the illustrations pull a reader in and slow them down to think, and the change of font and size for the text and the lyrics clearly sets them apart. Every page is an opportunity to make connections (and to wish for a soundtrack). It's even interesting to compare the backmatter of the two books. Rappaport includes a Selected Discography, paying homage to how important the music and lyrics are to the book. And with a publication date of 2004, it's historically interesting that she does not list specific websites, simply cautioning the reader to be careful about sites that aren't official Lennon, Beatles or history of rock and roll websites, "...for information and and lyrics may be inaccurate." One of my favorite parts of the new school year is launching writer's notebooks. 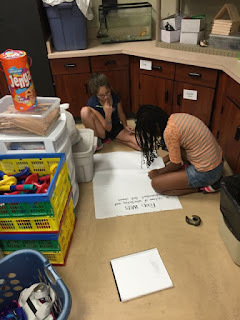 Anything seems possible as we list our A-Z of Me, sketch each of our roles ("new food tryer" is a favorite from one of my students this year), map our favorite places, and web the things we're curious about. 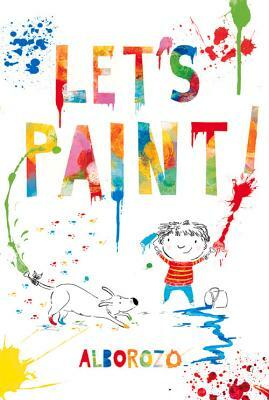 Let's Paint! by Gabriel Alborozo (Allen & Unwin, Australia, 2013) offers the same kind of encouragement to artists that I want to offer to my writers -- trust your ideas, no matter what shape they come in, find your own style, and above all HAVE FUN! and each one has a million worlds inside it. let those worlds inside your pen out!" "Who knows what will happen next? Still, I'm sure there will be many more words and stories to come for this king and queen." These are my hopes for my writers: that they will have fun, discover new worlds, and come to know that the possibilities are endless for their writing! 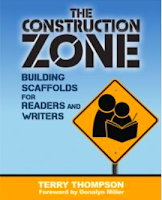 On Monday, September 14, at 8:00 p.m. EST, I will be facilitating the Stenhouse chat around The Construction Zone. I am excited to talk to others about the ideas in this new book. 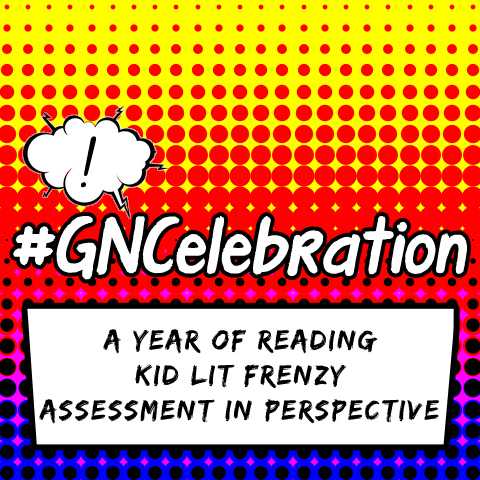 And, Terry Thompson (@TerryTreads) will be part of the chat so I know it will be a wonderful hour of learning! He gives us so much to think and talk about. So whether you've read the book or not, please plan to join the chat! 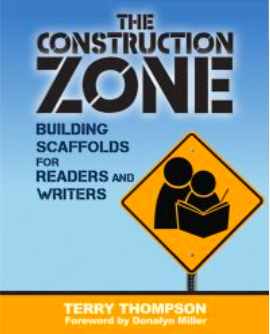 The hashtag for the chat is #ConstructionZone. I hope to see you there! 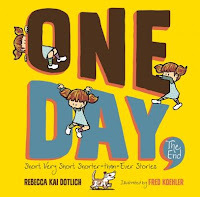 Last year, Jillian Heise read 180 books to her middle school students--one picture book a day. She shared this idea and the power of the #bookaday at Nerdcamp this year. I was intrigued and decided to give it a try. We certainly read lots of books every day but often they are in connection to something. 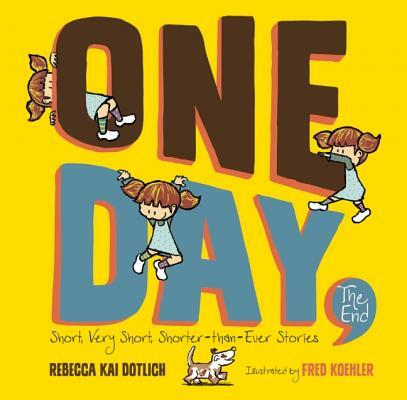 I decided that this year, we'd end every day with a picture book. A book just because. 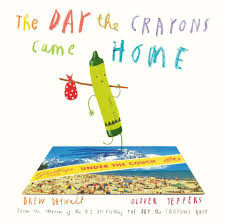 (Ending the day with a picture book was Colby's Sharp's brilliant idea and it ends the day on such a happy note!) This year, Jillian started a hashtag for teachers who were sharing books every day with their kids. 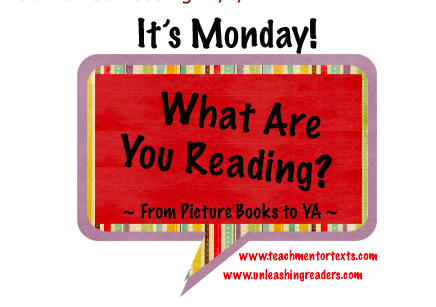 It is #classroombookaday. Some days we read a few more than one book but we've tried to end every day with a book. 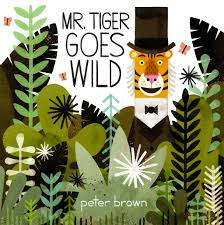 Here are the picture books we've shared so far, just because. 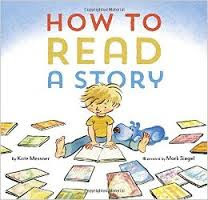 The Literacy Connection: Have You Registered to Hear Chris Lehman? before any human art was made. 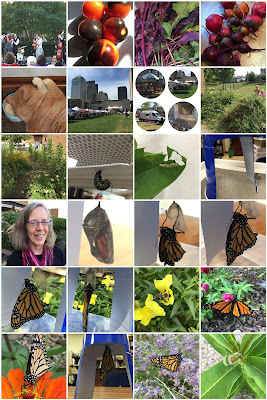 It's been such an amazing experience to have monarch caterpillars, chrysalises and butterflies in our classroom for the past two weeks! They were given to us by one of our building's paraprofessionals, whose mother collected the caterpillars and hung the chrysalises in nifty solo cup viewers. The last of the caterpillars started to make its J today and I overheard one of my students say, "I could just sit here and watch all day!" 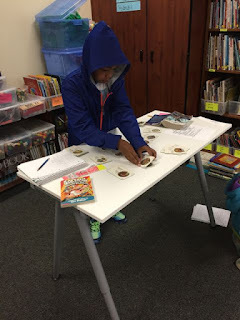 Another student caught the caterpillar's last voracious eating on video on one of the iPads yesterday. We haven't stopped marveling at the beauty of the chrysalises. Why the gold dots? There seems to be no scientific explanation. Nature just goes out of its way to be beautiful! If I'm understanding what I have read here, our butterflies might be fourth generation monarchs, the ones who will migrate to Mexico to hibernate for the winter before flying back to start the cycle all over again. This is as much of a miracle as the metamorphosis and the gold dots. What an amazing world this is! Linda has the Poetry Friday roundup at TeacherDance. The Dewdroppers at one of Worthington's concerts on the green. The clarinetist, Joe, sold me my bike! From my garden: Indigo Rose cherry tomatoes, and a crop of small beets with yummy beet greens (sautéed in bacon grease, of course). Our crazy cat drove us nuts for about a week not being able to keep food down. When we switched up his food, he was so happy he started sleeping with his head in his bowl! Columbus food truck festival -- yum. ...Land Lab reclamation. I was gone all of July and the constant rains were quite encouraging to the weeds! MONARCHS! 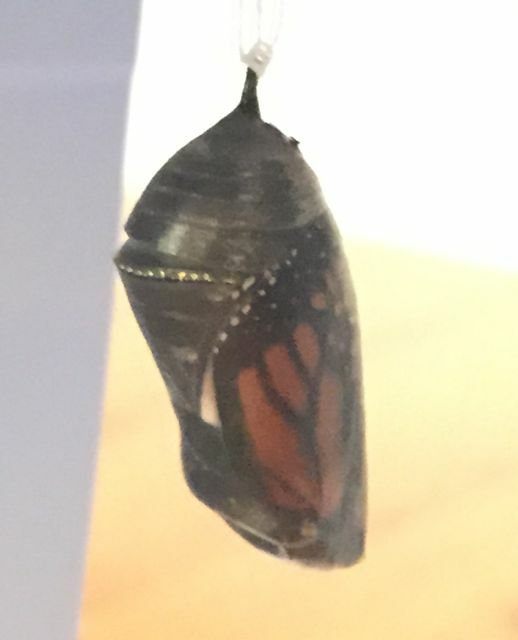 The mother of one of the parapros in my school gathered lots of monarch caterpillars, raised them, carefully placed the chrysalises in Solo Cup viewers, and donated them to my classroom, along with a caterpillar to watch through the entire process. What a gift. New glasses. No one has noticed, so that must mean they look perfect on my face. (Plus, they are still purple, so no big change there, but I can SEE! Yay!) The first butterfly emerged on Sunday. I found the clear chrysalis when I went in to feed the fish, and I brought it home. 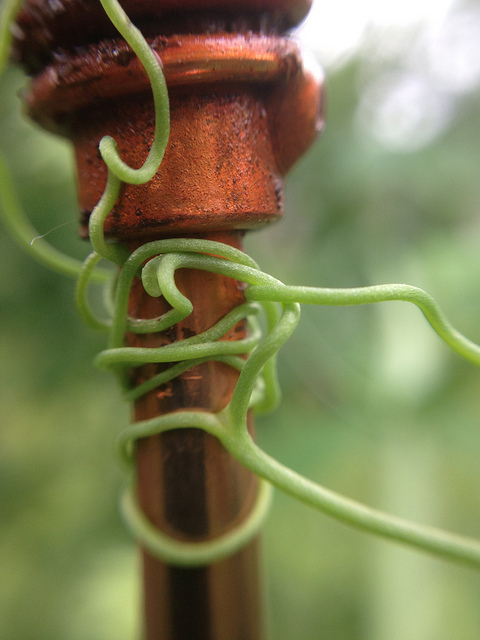 We missed the moment of emergence, but not by much. I took it outside to the snapdragons, and we communed with the bees as it prepared to fly free. This is a DIFFERENT monarch that came to the zinnias about the time our fledgeling crawled onto the snapdragons. Welcoming committee? Yesterday I found one ready for release when I got to school (and another emerged for the AM Latch Key kids to watch). I released both in the Land Lab, and when examining our milkweed there, saw that we have at least one monarch doing its thing in the wild. YAY! 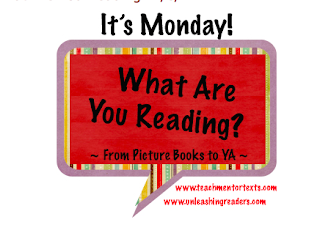 I read lots of blogs, I tweet, I follow #titletalk every month and I have lots of friends who tell me about new books. But I still LOVE my 6 issues of The Horn Book every year. I have been subscribing to it for years and years. It is one of the very few paper magazines I still get in the mail and it is the ONLY one I actually read every time it arrives. An hour or two with every issue and I get a ton of great reading and a lot of info on new books that I want to check out. 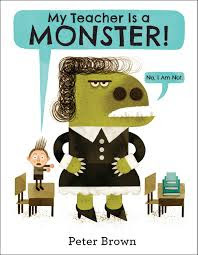 --I discovered a new series that looks promising for 3rd graders--Lola Levine, due out in November. 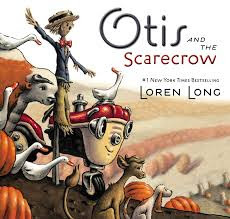 --I learned that a new book in the Ling and Ting series is coming in November! --I am interested in reading the new Graphic novel by Ben Hatke, Little Robot. -- I had NO IDEA that on September 1, The Full Moon at the Napping House would be released! Can't wait to see what they did with this one! --I loved My Heart is Laughing so am looking forward to When I am Happiest. --I loved Ship of Dolls and had no idea that here was a companion book/sequel. Interested in checking out Dolls of Hope. --Some of my favorite reads of the year (Waiting, Crenshaw, and Sunny Side Up) got starred reviews from Horn Book this month!! Such great books! --Two Mice looks like a great fun story told in two-word phrases. I always like the creativity in books like that! I LOVE LOVE LOVE the Horn Book and highly recommend it to everyone who loves children's books. One of the best resources out there for sure! And I'd also subscribe to the blog Read Roger for even more fun. The Horn Book is the best.